BB June’s workspace at Thistle and Pearl Tattoo. Photo by Karrigan Monk. 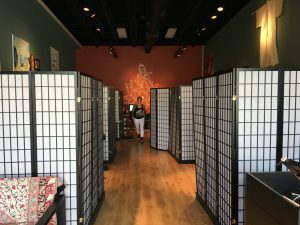 Like Sacred Lotus Tattoo, Thistle and Pearl try to make the tattoo environment as comfortable as possible for clients. The lobby of the shop features comfortable couches and the entire shop is decorated in a way that makes it feel less like a business and more like visiting a friend. What makes Thistle and Pearl Tattoo stand out for many clients is the fact they use Eternal Ink, a vegan ink. While this is a popular ink brand and many other shops may use it in conjunction with other brands, Thistle and Pearl uses it exclusively. June explained black ink comes from carbon and is often created from charred animal remains. In contrast, Eternal Ink produces black ink from charred plants. June employs four other artists, two women and two men. Although it is not something she intended, June said she thinks it is good to have a balance in a shop. She has worked in all-female shops as well as shops where she is the only female and finds it is best to have an even mix. June got her start in tattooing as a henna artist at a renaissance festival. She and her friend did this throughout high school and college, but eventually fell out of touch. Through what June called a serendipitous coincidence, she and her friend both ended up in California. June was a recent college graduate with no idea of what to do and her friend was a tattoo artist looking for an apprentice. At the time, there were very few female tattoo artists and June jumped at the chance to apprentice under her friend. Every day she took a train from San Francisco to Davis, where her friend’s shop was located. The apprenticeship lasted for a year and a half while she was also working another job in San Francisco. 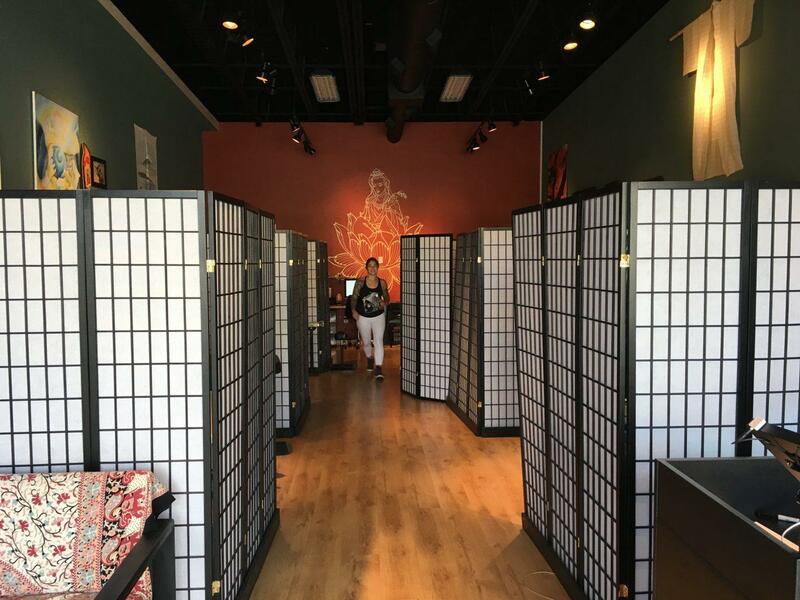 Sacred Lotus Tattoo strives to provide a comfortable and zen-like experience for all clients. Photo by Karrigan Monk. June is originally from Asheville and after living for 12 years in San Francisco and having a child, she moved back across the country to start her own shop. Like June and Leger, most tattoo artists become interested in the art early in life. Galen Holland, artist and owner of Freaks and Geeks Tattoo, cites a childhood experience as igniting his love for tattoos. Holland said his favorite part of tattooing is carrying on the craft while also making it his own and being a positive ambassador to the art form. Bianca Sky Kreba, an artist from Red Rabbit, grew up with a stepfather who was a tattoo artist. She said she eventually decided to pursue the art herself after spending so many years around it. For Kreba, the best part about tattooing is getting to create art every day. Her least favorite part is having to explain to uninformed clients that sometimes ideas just are not possible, a frustration June said she shares. Most shops in Asheville have a minimum charge of $60 and an hourly rate of around $130. Despite the fact many shops in Asheville have similar prices and talent, very little animosity lies between them. For those wanting a first tattoo, the artists all suggest waiting to find the right artist for the client and the piece. Leger said to look at as many portfolios as possible, to not go too small and to wait for the artist, even if they are booked for a while. Holland suggested to listen to the artist because they often know best and want to do right by the client.